Below is the information I have on the store. The article that follows is a unedited email received from Eddie Denton (who was kin to the Hicks by marriage) when I asked him about the store. I knew he had some interest in the store since I had viewed some pictures he had taken. These old buildings are rottening, falling down or are being torn down for new construction or lack of repair------one by one. And each one has a bit of history with it that is being lost. -------- "I think we call it 'Progress.'" The reason this old building caught my eye was that during some hot summer days I would ride my bike by this building. And then sometime this summer (2006) I saw in the paper that a car had run into the building, and looked to me beyond repair. So at this point I do not know the status of the old store building. The building is located about 2 miles south of Morganton on the west side of Enola Road in Burke County. Hello Dewey, Attached are some of the shots. The roses are beautiful when in full bloom as you know. The name of the Rose is Seven Sisters because each rose has seven clusters. 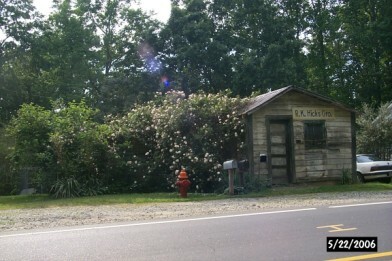 This was a common Rose at all the old home places in Enola. It is not exclusive to this area I am sure. I have seen it pink and white. I do not remember seeing a red variety. I estimate the store to be between 80-90 years old. It was built by R.K. "Kenner" Hicks, pronounced with a long e. He married Tessie Hawkins, who was kin to the Denton's and who's family owned the property that the store was built on. Kenner was kin to us as well. The family tree did not fork too much. As a boy, this was our after-church Sunday outing. Grandpa would take me and we would walk to Tessie's Store for a Coke and some crackers. It is located appox. a mile from our house. I do not remember going to the store except on Sunday afternoons. In addition to owning the store, Kenner Hicks drove the 1st taxi in Enola, so he was considered well off financially. He died in the 40's before I have a memory of him, so Tessie was the person I related to. Their only child, Roy Hicks, owns the store today. The store carried gas, flour, sugar, candy, ice cream, soft drinks, bread, and assorted can goods. There was a wood-burning stove in the middle of the store. I do not remember animal feed or large bags of anything in the store. It was the local news center and everyone from Enola or "up on the river" as we called the Bethlehem Community, stopped on the way home from work to get a snack or just to catch up on the news. Sadly, the character of the store was a man named Ernest Deal (Dale), but he and others in the community spelled and pronounced the name Deal. He was a uncle to Ralph Dale, the banker guy we know. Anyway, Tessie built him a small house close to the store. He was "touched" as the old folks would say which meant he was mildly retarded. Some of the men in the community would buy him ice cream to see him eat it. They would keep buying him ice cream until he got a bad headache and could not eat anymore. It is sad now, but not all memories are happy ones I guess.